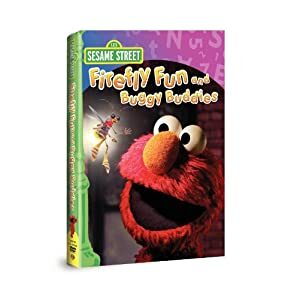 Warner Brothers is a publisher for Sesame Street DVD’s and they sent me a copy of Firefly Fun and Buggy Buddies to review. We watch this episode all the time, it is one of the episodes we recorded before we turned our cable off. So we have Elmo’s World Bugs, Slimey’s Pet Bug Dirty, and Fly, Little Firefly! We like to sing this song and pretend that we are little Fireflies right along with Telly Monster and Baby Bear. This DVD is all about bugs. Telly and Baby bear try to figure out how to catch a firefly. But once they do, they see that the firefly was sad. So they had to pretend to be fireflies to understand that the firefly was unhappy with the small amount of space he was stuck in. You know how Oscar has a pet worm? The worm Slimey wanted to get a pet, so Oscar takes him pet shopping. They then pick out a bug and have to learn how to take care of a pet together. Nick Junior sent us Wow Wow Wubbzy newest adventure on DVD; Escape from Dino Island. 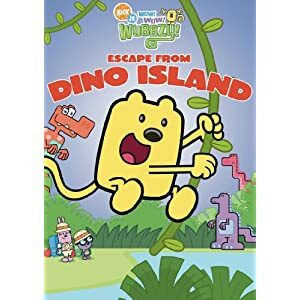 Wubbzy is a cute and quirky bendy-tailed character that takes viewers on many adventures in the brand-new DVD, “Escape From Dino Island.” Whether it’s exploring the jungle, swinging from vines or “discovering” friendly new creatures, you will find here. In Escape form Dino Island has six episodes and a bonus episode making seven total episodes for your preschooler to watch, and if they are anything like the two of mine then they will love Wubbzy in Escape from Dino Island. Start off with the adventure Escape From Dino Island, Then you’ll find Wubbzy The Hero, Call of the Mild, Wubbzy and the Sparkle Stone, Daizy’s Purple Thumb and Mt. Fizzy Pop. Then the final episode is Too Much of a Doodle Thing. Also a star on the Internet, Wow! Wow! Wubbzy! remains the top game for the past two years on Nick Jr. ®’s award-winning website (www.nickjr.com) and boasts the first-ever video podcasts for preschoolers at www.wubbzy.com. NCircle Entertainment and PBS sent me a copy of Sid the Science Kid Weather Kid Sid to review with my family.Sid the Science Kid is about Sid and his friends and the discoveries they make at school. They have science lessons every day, as they sing, play and interact with one another just like children do every day. The feel of the show is so natural, every day Sid gets up, struggles to get his breakfast eaten, goes off to school and plays with his friends. He occasionally has a play date after school with his best friend Gabriela. Gabriela is my daughter’s favorite character because of the pigtails, but she is also partial to May and her purple hair. Weather Kid Sid has four episodes with the first episode introducing the rain. They learned all about how the rain helps things to grow, and that it doesn’t just rain to ruin play dates. Another episode was about spending the day with his dad out in the sun. Sid was protesting the sun block, the same way mine did, but he learned all about why it was necessary to put on sun block. What is your kid’s favorite TV Show? All of the DVD’s above were sent to us for free to review from the companies listed. My middle son Casey is almost three and his favorite shows are Sesame Street and Little Bear. My oldest Son Caleb is five and his favorite is Wow Wow Wubbzy and Oliva. mcalcut follows you on twitter. MY son’s favorite show is Spongebob Square Pants. Thansk for the chance. My daughters favorite shows are Mickey Mouse Clubhouse and Little Einsteins. My son’s favorites are anything on food network. My sons favorite TV show is Chuggington. My daughter still loves Sesame Street. My daughter likes Handy Manny and his talking tools. It’s a cute cartoon. Thank you for the giveaway. my son loves Handy Manny! My kids love Wow Wow Wubbzy and Dora. My daughter likes Hannah Montana. Rugrats is my favorite kids tv show! I think dora would be my choice, there are so many to chose from. I hope I win, thanks. My nephews love My Friends Tigger and Pooh. He likes Sesame Street, Elmo is his favorite. my son’s favorite show is yo gabba gabba! My 4 year old granddaughter loves Dora the Explorer! My daughter loves Charlie and Lola. My daughter loves Blue’s Clues and Barney the best. My kid’s love Zoom! It’s very educating as well! My daughter’s favorite show is actually Sesame Street but Bob the Builder is a close second. Thomas the Tank Engine. We also have some of the old Shining Time Station shows on VHS and he loves them. But these DVDs will be a big hit too. Thank you for the chance to win. You won the children’s DVDs on Mom Start. Please send me your name phone number and address and I’ll ship your prizes out to you. My son is glued to the tv when Waybaloo is on. Have you seen that show? Weird! Wow Wow Wubbzy is probably the favorite in our house. My daughter likes Dragon Tales. My kids like Handy Manny. My daughter likes iCarly and my son loves Barney! Thanks! My daughters favorite show is MythBusters. My kids like Sesame street …thanks for the giveaway. My kids favorite show at the moment is Max and Ruby. Sesame Street is the favorite with our kids! My son’s favorite show is Wow Wow Wubbzy. also visit hotel in bandung..